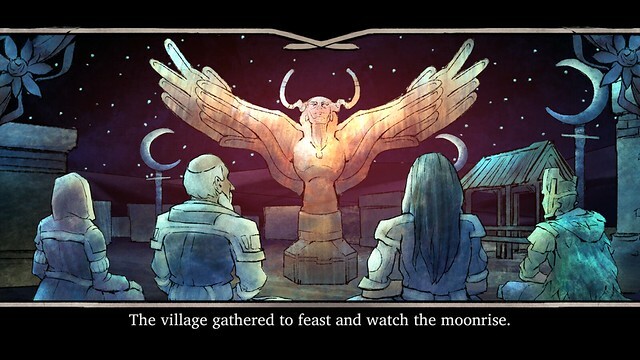 Update: the release date of Moon Hunters has been corrected in this article. 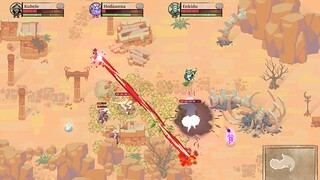 At long last, Moon Hunters is trekking to PS4, to be released in North America on July 19, 2016 through PlayStation Store. I’m the design lead on the team of five-ish making this game. We call ourselves Kitfox, and we’ve been working for years on this little world. It started as a doodled idea in 2013, inspired by old surreal and occult-looking paintings from our artist. Almost a year later we were Kickstarting, and when that was a clear success, BAM! We could afford to bring the game to PS4. It feels strange to think it’s been so long since we made that announcement – time passes really quickly when you’re working hard, I guess. It’s a little bit later than our original target of winter 2015, but we wanted to make it the best possible version of the game. 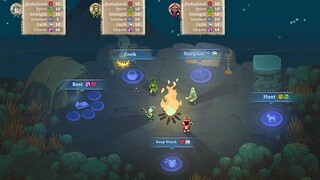 We only have a couple of months left until the PS4 launch, but there’s still lots of little details to tweak and fix, cooking to make more delicious, familiars to make more adorable, constellations to make more sparkly, etc. I’m sure it’ll be July 19 before I know it, but all we can do is buckle down and get it done. Part of the joy of being an indie developer is getting to have personal contact with your fans – and we’ve had our hearts warmed by all of your fan letters and fan art. Keep sending them, through Twitter and Facebook! Thank you! Awesome! I have been looking forward to this game! Does this mean the Vita version is no more? Was really looking forward to playing it on there, seemed like a perfect fit for the handheld. Will be picking this one up, have been following this since the Kickstarter. Looks like fun! +1 for vita version please! I also hope the lack of Vita mention doesn’t mean it’s cancelled. Finally, a reason to invest in a PS4… other than Ratchet & Clank. I like single-player, story-driven games and platformers, third person games… too many FPS out there I can’t control due to disability. Something simply fun, with beauty and depth! Wasn’t a Vita version in the works? Is that still happening? I have a PS4, but would love to play this on Vita instead. What ever happened to the vita version ? Please don`t tell me it`s been silently cancelled. …great, another solid game to consume my summer. I need to get the AC installed ASAP. Even if there is not a PS Vita version or it comes out later there are still other games coming out for the portable. So if this one game was all that you were looking forward to then too bad now what? I almost bought this on Stream about a month ago, now I’m glad I didn’t as I would much rather play it on PS4. I didn’t didn’t even know that it was coming to PlayStation, I guess I must have missed the previous announcement. Anyway, single-player story-driven games are my favorites, and this looks right up my alley. Day one purchase for me. Thanks a lot! Any idea how much it is going to be yet?